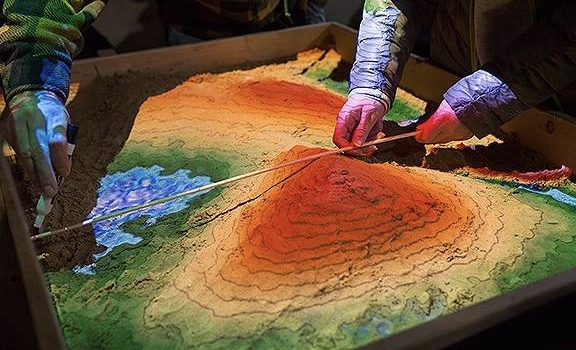 AR sandbox, Texas Tech Department of Landscape Architecture © Texas Tech Department of Landscape Architecture. Serpentine Augmented Architecture, a global open call for creative practitioners to design groundbreaking architectural structure to be developed and experienced in augmented reality (AR) on site at the Serpentine Gallery in summer 2019, has been launched (1 Feb 2019) by the Serpentine Galleries in collaboration with Google Arts & Culture. The deadline for entries is 25 Feb 2019, 10am. “Not having an historical collection means we can focus on the issues of the future”, said Yana Peel, CEO, Serpentine Galleries, one of the judges, at the launch. “Augmented reality presents a significant moment within architectural practice: one that radically challenges our understanding of city spaces and the environment by creating a highly visible interface between the physical and the digital (infra)structures that surrounds us”, the brief states. “The rules of AR have not yet been defined. We’re particularly excited to see concepts that embrace social interaction, collective experience and the unknown”. The judges include Sir David Adjaye OBE, architect and Trustee of the Serpentine Galleries; Virgil Abloh, artist and designer; Freya Murray, Creative Lead, Google Arts & Culture Lab; Amit Sood, Director, Google Arts & Culture; Greg Williams, Editor-in-chief, WIRED, UK. Proposals need to explore how AR can be used to develop, transform and enact new idea about how cities and public spaces can be designed. Entrants need to demonstrate how their proposals reinvent the city, rethink spatiality and reactivate the Serpentine’s park site with natural life and over 12 million visitors each year. An important part of AR is who has access to it, and Adjaye said at the launch that he perceives the Serpentine Augmented Architecture project as “a great opportunity to further democratise architecture and design, allowing the tools to be used by others”. Shortlisted commissions will be guided and mentored by advisors from architecture, engineering and immersive technologies to develop their ideas and test their feasibility. A final commission will be supported by a production team led by the Serpentine Galleries. Google Arts & Culture has been an innovation partner for cultural institutions since 2011, working on technologies that help preserve and share culture and allow curators to create engaging exhibitions online and offline, inside museums. The Google Arts & Culture app puts over 1800 museums at reach and is free on the web in iOS and Android.